Domestic Violence, Battering, Abuse … there are many words used to describe what one person is willing to do to control their intimate partner. It is a nightmare for many individuals. The fact that someone we love or care about would harm us emotionally or physically is devastating. Please know that you are not alone. The Domestic Violence Intervention Program (DVIP) exists because battering by an intimate partner is the single greatest cause of injury to women. Trauma and its impact on women, men and children has been well documented as a significant public health concern. As you read the rest of this letter and consider each point, please remember you deserve a life free of violence. NO ONE has the right to control, emotionally or physically abuse you! Domestic abuse is a pattern of behaviors, including violence that an abuser uses to CONTROL his /her partner. Using violence and/or other controlling behaviors is NOT ACCEPTABLE. No one causes another person to abuse, no matter how they act. Abuse is always the choice of the abuser. Battering is not mutual and it is not a couple’s quarrel. Disagreements happen occasionally in all relationships, but battering invades every aspect of a relationship with fear and control. You are the victim of a crime. Almost any reaction is normal. Some individuals come to shelter to find out if they are “sick or crazy”. They are not. Crazy-making happens in every abusive relationship when the abuser lies, denies, and/or minimizes the abuse and blames you for the violence. You aren’t going crazy; you are having a normal reaction to trauma and a crazy situation. Others may react in ways that seem hurtful because they do not understand what you are going through. If you feel uncomfortable with that person, it is OK to look for support elsewhere. You are a GOOD person! You are a SURVIVOR with strength, courage and skills that have gotten you this far. This may be the worst thing that has ever happened to you. At this time in your life, you deserve support, whether it is from friends, family, a therapist or the DVIP. Do the things that make you feel safer and better. You are not responsible for your partner’s abusive behavior! Here are visual examples of what an abusive relationship looks like and what a healthy relationship looks like. They are here to help you sort through what you are experiencing and to examine if it matches the experiences of other individuals that have been abused by an intimate partner. 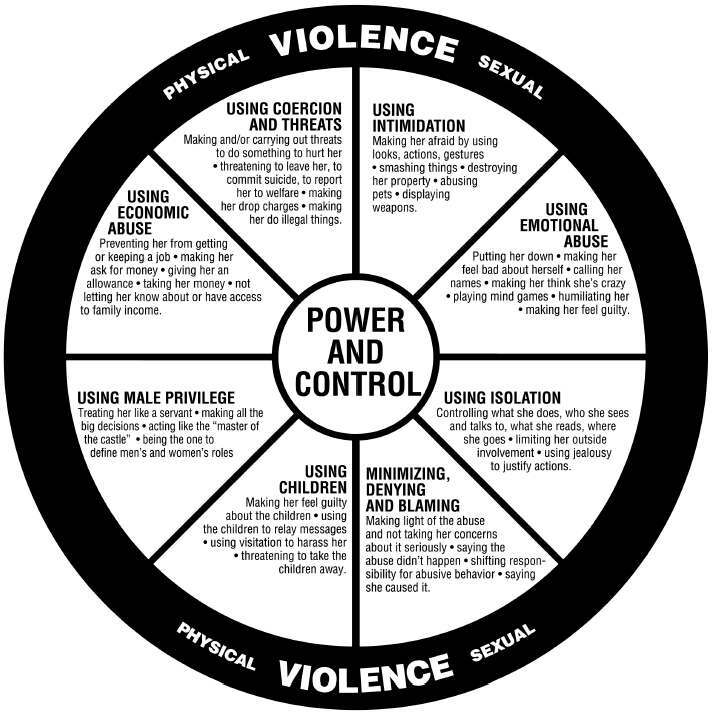 The Power and Control Wheel, written by women to describe their experiences at the hands of their abusive partners. We encourage you to examine the wheel in reference to your own relationship. The behavioral checklist may also be helpful. 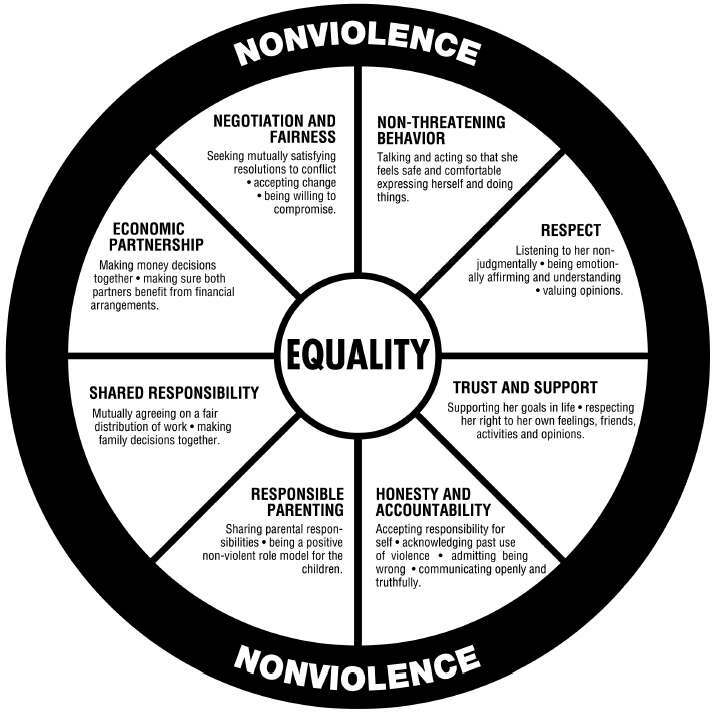 Below is the Equality Wheel, part of an educational curriculum for men who batter. We encourage you to examine the wheel in reference to your own relationship. We are here to support you as you explore your options and to provide information as you are caring for yourself. All direct services provided by the Domestic Violence Intervention Program are free and confidential. For more information call our 24-hour hotline: 1-800-373-1043.